Attending: Derris Watson, Claire Keeley, Jill Hagar, Julia Walsh, Steve Keeley, John Bailey, Alan Silverstone. Apologies: Simon Soady Geoff Symon and Jenny Fowler . Derris opened the meeting at 1930. The meeting was called to mark the end of the 8 week Consultation Period. This was longer than the required 6 weeks to allow additional time for the Christmas break. Comment on ECR1 with a recommendation to add additional information to explain why the plan adopted the development boundaries from the Caradon Local Plan. Derris proposed a minor amendment to the ECR1 policy and this amendment was endorsed by the group. Additional numbering to add clarification to policy ECR3. Endorsed by the group. Amendment to ECR3 to change the split of affordable/market value houses in developments outside the development boundary from 40/60 to 50/50. This recommendation was not endorsed as it was felt that it would be too stringent and result in affordable housing numbers outside the requirement. The majority of the group felt that there was no need to be as restrictive as the recommended numbers suggested. There is a recommendation in the email which requires the developer of the Hockings House site to put in the footpath to the sports field before any development is occupied. The site plan already requires the footpath to be put in before development work begins as it is thought that this would increase pedestrian safety during the construction work. The group agreed to leave the requirement as it is. A comment from the Transport officer regarding footpaths from sites 2a, 2b and 8 was dismissed. There is already a plan to put in access from sites 2a onto St Cleer Common, which is open access land, which would enable safe pedestrian access to the village. A footpath from site 8 (water works) is considered to be not practical or required as this is a site for commercial properties. The Transport Officer also made a comment regarding the provision of sufficient off-road parking at future developments. This comment was also dismissed as it is already included in the design guide. There were a number of comments from those public bodies included in the consultation. These were reviewed and discussed. All of the bodies that provided a comment were supportive of the plan and its aims. These comments are included in the St Cleer NDP Consultation Statement. There was further discussion regarding the protection of heritage sites and the group’s initial requirement for a 50 m ‘exclusion zone’ around such sites. At the suggestion of English Heritage the specific distance had been removed and replaced with descriptive, and hence more restrictive, requirements. The group agreed to follow the advice from English Heritage and the policy has been amended. The group agreed that the plan should be submitted to St Cleer Parish Council for their further endorsement and submission to Cornwall Council to enable the Plan to be taken forward through the process and examination and referendum prior to being ‘made’. Derris encouraged members of the group to attend the Parish Council meeting to represent the plan and to encourage endorsement by the Parish Council. The meeting was closed at 2025. Attending: Derris Watson, Geoff Simon, Jenny Fowler, Alan Silverstone, John Bailey, Julia Walsh, Jill Hagar, Claire Keeley, Steve Keeley. Derris explained that Mick Chorlton had decided to leave the group. Mick’s hard work and common sense will be missed by the group. The last meeting was largely concerned with a discussion about housing numbers and there then followed an extensive email exchange on the subject. Derris went around the table, asking each person what they thought we should do about the number of houses recommended in the Plan. All agreed that we should continue with the 120 that is in the Plan now. Claire Keeley expressed a concern that whilst there was an urgency to have a plan in place to protect the Parish, we could not afford to rush resulting in the plan failing. Derris distributed copies of the current plan and of a supplementary document for discussion. Steve pointed out that we had gone through the document last time and had already made a number of changes. These changes were reviewed and a small number of additional changes were made. The Plan still requires a forward so, in the absence of any other volunteers, Derris agreed to write one. Derris explained the contents and purpose of the supplementary document. The group agreed that it held sufficient additional information about the Plan and the work that had been done. Nobody could suggest any additional information that could go into it. It was agreed that the Plan and the Supplementary Document should be presented to the Parish Council at their next meeting for their formal sign-off of the St Cleer Neighbourhood Development Plan, which would then go forwards to an 8 week public consultation. 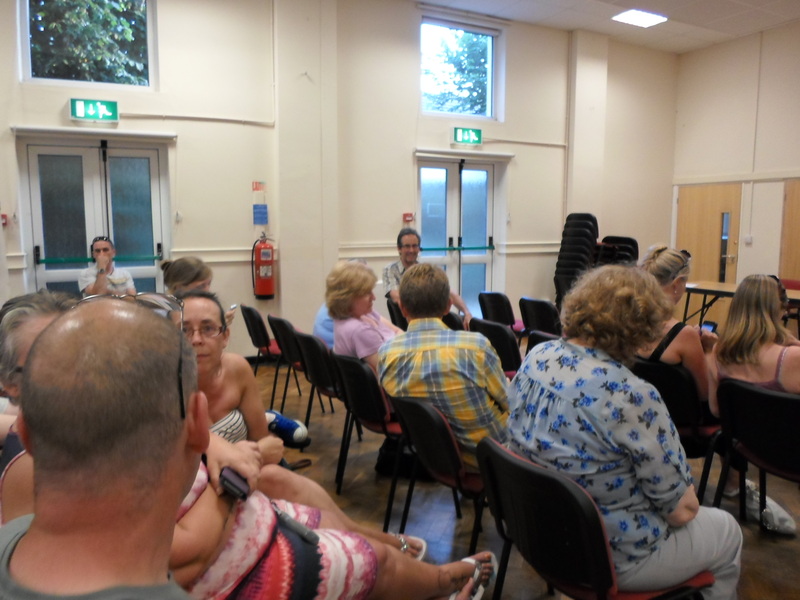 It was agreed that the requirement for the next meeting would depend on the outcome of the Parish Council meeting and that Derris would inform the group (by email) after the Parish Council meeting. The meeting was closed at 2100. Present – Derris Watson (Chair) – Mick Chorlton – Geoff Simon – John Bailey – Steve Keeley – Claire Keeley. The meeting was opened at 7.35 pm by Derris Watson. Derris handed out a draft copy of the Neighbourhood Development Plan for the group to approve. Mick brought to the groups’ attention the amended housing figures he had obtained from the Consultation on the Cornwall Local Plan – Strategic Policies – Proposed Submission Document. He explained that using the new calculations it meant that the Parishes new figure could be reduced from the proposed 120 down to a possible 100. There was a lengthy conversation between group members. Steve agreed with Mick adding that CPRE figures would also support Micks findings. It was decided that the group should work through the proposed NDP document amending anything it was decided necessary to change. The group read and made changes to the Opening Statement – Boundaries – Heritage, but were unable to agree on changes to be made on housing. Derris advised group members that if they were unable to come to an agreement that evening then it would mean delaying the plan being submitted. The group decided that all members should be given the opportunity to comment on whether the housing policy document should be altered and that it was better to have a delay and get it right than to rush and risk failing. Suggestions made were that one of the preferred sites could be held back in reserve to use only if necessary, therefore adjusting the housing figure we would allow to be built in the parish but leaving us with available land that could be used should the need arise. John proposed that all members not present should be emailed to ask for their view on the housing numbers. At 9.30 Derris called an end to the meeting. Agenda: Read, Amend and Finalise Plan. The feedback received from CC was discussed. It was agreed that the aspiration to submit the plan for consultation on 1 September was not now possible. The plan came about following the rapid analysis of the questionnaire and finding ourselves a month ahead of where we had expected to be. It was agreed that there was too much work to do before we could comfortably submit the plan. Zoe Bernard-John’s email of 18 Aug was discussed. This email advised the Group to re-structure the Housing Policy into separate Site-Specific Policies (SSP). Some thought that this was a good idea as it would enable the Group to write down what we expected at each site. It was agreed that we needed a template to determine what these SSP should contain and the format of them. This would enable different people to write each SSP and have them all look similar. As the Group had also received further comments on the policy documents themselves there was further discussion about these comments. There was some unrest as this was the second set of comments received. Why they have advised re-structuring the NDP and writing SSPs. Why they have sent a second set of comments on the policies. Derris took an action to contact CC (Gemma Hankins, Zoe Bernard – John and Sarah Arden) and arrange a meeting in early September. The meeting was closed at 2040. Attending: D Watson, S Keeley, C Keeley, M Chorlton, J Bailey, N Ellis, Jill Hagar, K Partington-Ward. Collation and Reporting of Survey Results. Steve Keeley would do the first round of analysis. He said that he would produce a spreadsheet which would give the numbers of answers in each of the basic yes/no/no comment questions. He said that his spreadsheet would record if comments were made but would not record the actual comment. He said that, depending on the number of comments, he would try to start putting them into catagories for further analysis. Karen Partington-Ward would type the comments into a ‘word’ document for reporting and further analysis. Derris Watson would extract the details of people who had agreed to accept a business questionnaire. She would write addresses onto envelopes so that the business questionnaires could be sent out. There was a discussion regarding the business questionnaires. Derris informed the group that Steve Vinson, the CC Economic Development Officer had reported that there is a waiting list of people who wanted to rent industrial units in the town. It was agreed that these people should be sent a business questionnaire to see if they would be interested in a unit in St Cleer. It was also agreed that all of the known businesses in the parish e.g. Farm Shop, garage, hairdresser etc would be sent a business questionnaire even if they had not completed a general questionnaire and asked for one. This would ensure that business owners got questionnaires if they did not live in the parish. The business questionnaires would go out at the end of July and be given 2 weeks for completion/return. Date of Next Meeting. The next meeting will be at 1930 on 4 September 2014. The meeting was closed at 2020. Present: Derris Watson, John Bailey, Mick Chorlton, Jill Hager and Alan Siverstone. Derris reported that she had met with Gemma and Zoe to discuss the consultation process. They both approved of the questionnaire and the way the questions were framed. 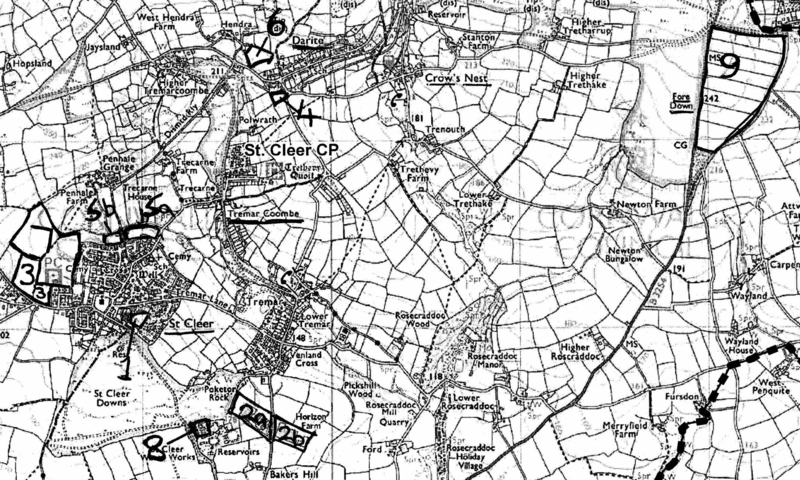 They had asked about maps and Derris had explained to them that the maps and other documents could be viewed on the website www.bodminmoorplans.net/maps and that all these would also be made available at the 3 exhibitions. They were very pleased with the idea of the 3 exhibitions and very approving of the content. When they had viewed the documents on the website they were extremely pleased with that content. The group discussed the distribution of questionnaires and various members agreed to distribute parts of the parish so that we achieve full coverage. Any one else who would like to help please contact Derris. We need to decide how the results will be analysed and by whom so a meeting will be held on 18th July to look at this single issue and a full meeting to discuss results and whether any revision is required will be held on 4th September. Attending: Derris Watson, Steve Keeley, John Bailey, Jill Hager, Jenny Fowler, Geoff Simon, Simon Soady, Nicola Ellis. The meeting was opened at 1930. The minutes of the previous meeting were accepted without comment. Derris produced a map that she had received. It showed the village and settlement boundaries and proposed sites for development in the parish. The draft questionnaire had been sent to Gemma and she had passed back comments and suggestions for improvement. Recurring through her comments was the requirement for maps and diagrams in the document. Whilst these would undoubtedly help to show where development sites and boundaries were, it was generally felt that their inclusion would make the document too big. It was agreed that the maps would be at the exhibitions. The purpose of the questionnaire was discussed. It was agreed that the purpose of this questionnaire was to gain endorsement of our draft policies. Derris informed the group that she had learned of the requirement for a further consultation i.e. A further 6 week consultation by the Council. The difference between formal and informal consultations was discussed. It was agreed that a significant number of objections or comments on any particular issue would lead to the requirement to re-write that policy/section. Nicola asked whether we had a mandate to write the policies. This was discussed but most agreed that the fact that we were meeting and working towards the NDP gave us a mandate to write the policies in the first instance and then seek community approval of them. Gemma had suggested that we should include a space for the community to write comments in the questionnaire. It was agreed that, in order to make the document neater, easily compiled and read, there would be a space at the end of the document for comments. Jenny mentioned that she helped at the ‘Open Doors’ facility and that the NDP was sometimes discussed there. This lead to a suggestion that we should consider putting posters up around the village to provide information about the plan. Steve showed everyone a poster that Claire had produced, initially as an idea for the exhibitions. This poster was well-received and Derris said she could print and laminate the posters which would then be placed on the various noticeboards around the parish. The remainder of the meeting was spent going through the questionnaire and Gemma’s comments on it. Derris undertook to amend the questionnaire to reflect the discussions. There was a discussion about the ability for households to obtain additional copies of the questionnaire to enable everyone in the house to express their view. It was agreed that the best way to do this would be to hold the additional copies at Open Doors and to add a note to the questionnaire to explain that extra copies were available. This would allow more than one return from each household but retain some control over these additional copies. The meeting was closed at 2110. As members left, Derris asked everyone to let her know their availability for a further meeting in approximately 2 weeks. The next meeting is to be on 26 June 2014. Present – Derris Watson – John Bailey – Nicola Ellis – Suzanne Horsfield – Geoff Simon – Julia Walsh – Jenny Fowler – Peter Lockley – Alan Silverstone – Simon Soady – Mick Chorlton – Claire Keeley – Julia Walsh – Harry Francis. Derris introduced Harry Francis, joining the group that evening, who is the youth club’s chair. Minutes of the last meeting were offered up for discussion. No amendments were made and minutes were accepted. Derris informed the group that the Parish Council had made a request to create a link on their website to the minutes of the groups meetings. It was agreed that this would be a good idea. Farm shop is not the only drop off box for the questionnaire and the others should be added. ‘Our plan’ should be changed to ‘The plan’. Our website should be included in the letter. Controlling development should not be a definite yes, should say yes can control to a certain extent. What sort of houses and where. Number of houses to be built, using the word approximate when referring to how many. The word ‘Must ‘build to be replaced with ‘planned to’. Mick asked for it to be noted that the group thanked Steve for all his hard work. The group then discussed the design statement. Derris asked that the group should read and inform by email or at the next meeting of any changes they felt should be necessary. NDP Vision was discussed. Derris informed the group that the Vision Statement would be on the first page along with a picture of the village. Future Statement is not yet completed but included to show the general layout. Sustainable Development – It was decided to revert back to some of the wording from the original draft document. As Nicola had already worked on the document it was decided that she would complete the alterations/additions. Boundaries– There was a discussion about this document and several alterations were made The document was agreed and accepted. Heritage – Gemma (Cornwall Council) had advised the group of some alterations she felt were needed to the Policy ECRHER these were noted and made. Document was agreed and accepted. 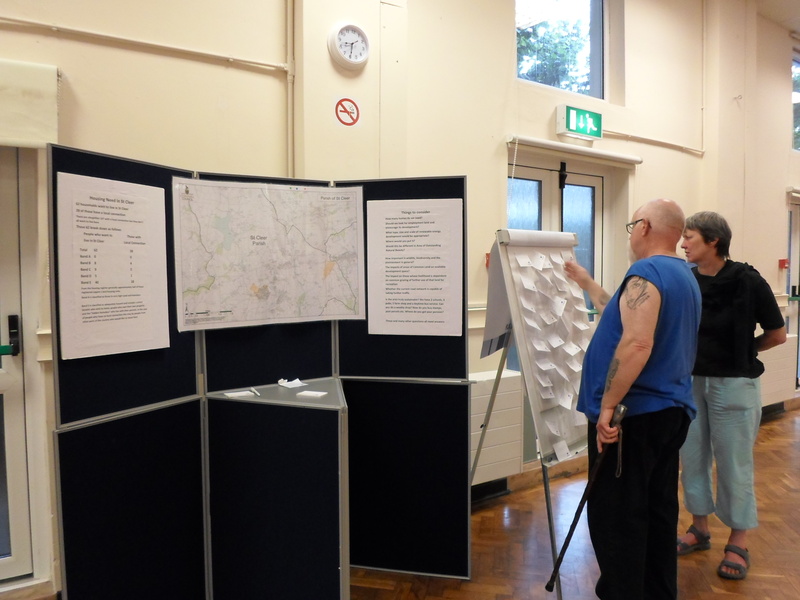 Housing – There was a discussion about the housing need in St Cleer and the type of housing that would be required to fulfil this need. Derris informed the group that Cornwall Council had applied for some parts of the Bodmin Moor area to become official dark skies areas enforcing the need to ensure that new developments do not contribute to light pollution in these areas. It was agreed that this should be included on the housing document. Changes were made and document was agreed and accepted. Green Assets – Gemma and Zoe (Cornwall Council) had expressed concern over the wording ‘definitive’ in the policy justification when describing local footpaths and bridleways. Mick explained that these paths were clearly marked on maps readily available to view. It was decided that we should obtain pictorial evidence to back our statement. Other additions to this document included the statement regarding recreational facilities, it was agreed that this would encourage prospective developers to offer improvements to facilities in the parish. Group agreed changes and document was accepted. Economic Development– The group discussed this document. The road to Siblyback was mentioned and it was agreed that this paragraph should be changed to read ‘a favourable traffic impact assessment’ the document was agreed and accepted by the group. Renewable Energy – The group discussed this document and it was agreed and accepted. Infrastructure – There was a discussion about the wording used under the section ‘roads’, Suzanne felt that Fore St should also be included along with Well Lane as this road is also overburdened. It was also noted by several members of the group that it would be difficult to allow any large development in the village if our policy is to not increase traffic through these already overburdened roads. It was felt that we need to be clear what we do want and not contradict our own statements. It was decided that Nicola would rewrite the policy to make it clear that the parish would not want any large scale development as this would significantly increase traffic in those areas. There was a discussion about the utilities, or lack of, in the parish. It was suggested that the sewage system currently in place would be unable to cope with any large developments within the parish. Water pressure was also discussed and that new developments would only cause this to deteriorate further if facilities were not improved. It was agreed that developers would have to agree that they would install adequate facilities to cope with any new development so as not to add to an already strained system. Nicola agreed to amend the document to include the group’s suggestions. Questionnaire – The group discussed questions to be placed on the questionnaire. It was decided that there should not be too many choices a simple -Yes, No, don’t know – would be sufficient. It was decided that the draft policy should appear first and the request for available land should be moved further back. Harry was expressed concern that nothing appeared to be aimed at the youth of St Cleer. Derris explained that a questionnaire designed especially for them was being undertaken and that we would visit schools and youth clubs to gain their opinion. It was discussed where in the document we should ask had they attended any of the NDP exhibitions. It was decided that we should include the dates of the exhibitions at the beginning of the questionnaire explaining that information would be available to them that would help them to make an informed decision on filling out the questionnaire. It was decide that the questionnaire needed more work. Geoff asked that all sub -committee groups should email him two questions on the document they worked on to be included in the questionnaire. Attending Derris Watson, Steve Keeley, Mick Chorlton, Peter Lockley, John Bailey, Jill Hagar, Jenny Fowler, Geoff Simon, Simon Soady, Karen Partington-Ward, Nicola Turner. Apologies Claire Keeley, Julia Walsh, Nuno Correia, Alan Silverstone, Suzanne Horsfield. Minutes There were no comments on the minutes of the last meeting. Derris explained that the policy papers had been sent to CC for comment and advice and that they had been returned with a number of comments. Whilst the comments were mostly of a minor nature, some work was required to incorporate them and to edit the documents to produce the next draft – which will probably be the last before Issue. It was agreed that a small working party would be formed to do this work. The working party is to comprise of Derris, Nicola and Mick, being one representative from each of the groups that originally produced the documents. There was a brief discussion about the comments. There are 2 policy documents which were sent separately to CC. These have yet to be returned. It was agreed that if the working party choose not to incorporate the comment or advice from CC then they would consult CC to ensure that they were not losing something important e.g. a rule that we are not aware of. It was agreed that Simon would complete his work on the Design Statement (which is nearly done) and then send that to CC for comment. There was a brief discussion about building houses for energy efficiency especially solar power i.e. N/S orientation. It will be a written questionnaire. It will coincide with the public exhibitions. We had been offered the services of a graphic designer to ensure the questionnaire had a professional look. The exhibitions would be in the village halls at Darite, Common Moor and St Cleer. Questionnaires returned by end of July. o There are some in the minutes of the meeting that Gemma attended. o Gemma gave us a sample questionnaire. o There are some in the Tatenhall NDP, which is on-line. o We need some questions directed at businesses. o Some questions are in the Infrastructure and Vision draft policy documents – these are in red. There was a discussion about questions to ask about shops and other facilities in the village. Mick and John pointed out that in the past there had been 5 shops in the Parish. Other members of the group pointed out that most people prefer to shop at cheaper supermarkets, making small village shops unviable. A working party was established to put together the questionnaire. This group is to consist of Geoff, John and Simon. They will aim to produce the draft questionnaire in time to distribute it to the group before the next meeting. The questionnaire should go to CCC for advice/comment. Steve agreed to write the introduction to the questionnaire. This will include the invitation to the exhibitions. Mick mentioned that he thought that Harry Francis would be pleased to be invited to join the group as a youth representative. It was agreed that this would be a good idea because, combined with the youth questionnaire, it would demonstrate that we had consulted across the community. Steve suggested that the consultation should be in colour to increase the chances of it being read and completed. Whilst this would be more expensive it was agreed to investigate the cost and have colour printing if we could afford it. The group had been given £1200 by CCC. To date £400 of this grant had been used on printing, purchase of exhibition equipment and hire of St Cleer Village Hall. Derris asked what the group thought about holding the Saturday exhibition at the sports hall as this would avoid the cost of hiring the Memorial Hall. It was agreed that this cost (£50-60) was worth paying as more people would visit the Memorial Hall. o It may encourage attendance. This was undecided. The exhibition would comprise of background information and evidence, maps of the parish with special landscape designations and details of the various sites for development, including those that are not supported by the group. Further details of a Neighbourhood Plan should be provided. Derris informed the group that Adrian Gott would be attending the Parish Council meeting on Wednesday 28 May. He is representing the Dean Family Discretionary Trust, the potential developers of the site adjacent to the Memorial Hall and the site at Baker’s Hill. The site adjacent to the Hall had proved not to be a viable site for 30 affordable houses and the agent wanted to negotiate options around mixing affordable and market value houses. Derris assured the group that this would require anew planning application to be submitted. Derris also said that the application to develop the site at Railway Terrace in Darite would go before the planning committee on Tuesday 27 May. She said that Mick was attending on behalf of the Parish Council and asked if anyone could speak on behalf of the community. It was agreed that Alan would be the best choice for this task but Karen agreed to try and attend if Alan was not available. The next meeting will be on Wednesday 4 June. It is possible that this meeting will not be required if the draft questionnaire reaches suitable maturity to be sent to CC without discussion at a meeting. Derris Watson, Claire Keeley, Steve Keeley, Nicola Ellis, Alan Silverstone, Mick Chorlton, John Bailey, Karen Partington-Ward, Julia Walsh. Peter Lockley, Suzanne Horsfield, Jill Hagar, Jenny Fowler, Geoff Simon, Simon Soady. Derris – The chair opened the meeting by welcoming everyone and recording apologies. The minutes of the last meeting were distributed. Everyone was asked if they had any further comments to add to them. There were no further comments. At the previous meeting, Peter Lockley distributed a paper and asked everyone to read it. The only comment on this paper was that it did not raise any new issues or points that had not already been discussed. Green Assets: This document was supported and it was agreed that it needed no further work. Economic Development, Employment and Community Facilities: With the exception of more positive statements to encourage tourism and the development of facilities for holiday-makers, this document was supported and it was agreed that it needed no further work. Infrastructure: It was agreed that a great deal of useful work had gone into the preparation of this paper but that it still required further work. Whilst the descriptive element of the document was good, and will be used elsewhere, the actual policies in the document needed more emphasis. The document needed some editing to ensure that the policies were clear in a ‘short and sharp’ paper. Mick Chorlton questioned the accuracy of the description of the footpaths in the Parish and the issue of hooliganism in the play area. Sustainable Development: This document was supported and it was agreed that it needed no further work. The other policy documents prepared by Nicola’s Group – Vision and Renewable Energy – had been accepted at the last meeting. The Vision Statement: Was supported. The Development Boundary: it was agreed that with a few minor amendments, most notably the addition of a statement to control development North of a line from Foredown to Redgate, this document needed no further work. Heritage: This document was supported and it was agreed that it needed no further work. Housing: There was a great deal of discussion about this document which was mostly about clarifying the housing need. Nicola had commented that a NDP from Slougham was rejected because of insufficient or inaccurate information. The requirement for a further Housing Needs Survey was discussed. In general, it was agreed that sufficient information about the local housing need and the requirement for St Cleer Parish to contribute to the overall requirement for new housing in Cornwall existed. This information should be in the St Cleer NDP somewhere, possibly in its own section, and referenced in the housing policy. If our agreed policy is the same as that in the CCC policy paper then there is no need to repeat it. Policy Statements, Objectives and Justifications should be phrased in a positive manner e.g. ‘to control development’ rather than ‘to stop uncontrolled development’. End June 14 Public consultation and exhibitions. To try to avoid the July/August holiday period. This consultation should include a section specifically aimed at the business community to try to get their views on future development requirements. There was insufficient time to discuss the topics/questions for the next public consultation or ideas for the exhibitions. It was agreed that this should form the agenda for the next meeting. The next meeting will be on Thursday 22 May at 1930. Mrs Derris Watson (arrived 7.35)Mr Steve Keeley ,Mrs Claire Keeley ,Mr Peter Lockley ,Mr Simon Soady ,Mr Alan Silverstone , Mrs Nicola Ellis, Mr John Bailey, Mrs Jill Hager, Mrs Jenny Fowler, Mr Geoff Simon, Mr Mick Chorlton, Mrs Karen Partington –Ward. John Bailey explained that Derris had been unavoidably detained and had asked that Steve Keeley should stand in as chair and start the meeting. Steve Keeley addressed the group. Mr Lockley had called Derris’ leadership into question via email sent to the group so Steve proposed a vote of confidence this was seconded by John Bailey and all members except one supported Derris. Steve began with the matter that Mr Peter Lockley had expressed some disappointment via several emails regarding the content and presentation of the notes of the groups meetings, he had expressed disappointment that not everything that had been said had been included in the minutes. b) These notes would be typed up into an outline of what was discussed at each meeting. e) At the next meeting if any member of the group felt that something important had been missed or that there was an error then this would be noted. a) At the end of each meeting the group would agree subjects for discussion for the next meeting. b) Any emerging issues could be emailed to the chair. c) If the chair felt these issues were worthy of adding to the agenda the group would be informed via email. Peter distributed a note that he wished everyone to read and discuss. Steve recommended that this note should be read outside the meeting for discussion at the next meeting. Chairmanship was then handed over to Derris. Derris’ opening address was to praise the group for their efforts to date, that their achievements so far were commendable. She spoke of the 4 public meetings we had had and of the written consultation and informed the group that it was always the intention to do more. There was general agreement on this point. Derris then talked about the St Cleer vision and how this should be a short ‘punchy’ statement. This was agreed by the group. Derris asked each sub- committee to present the work they had done so far. Nicola mentioned a sustainable development policy, (she had emailed the group that she was concerned that this was missing). It was agreed that Nicola’s group would include sustainable development in their Infrastructure work, which they had yet to complete. There was a general discussion about sustainable development and how this should be included in our plan. Nicola talked the group through the work they had done on the vision statement. She pointed out where she felt it needed more work. She spoke of our previous public consultation and the fact there were not enough questions asked, she spoke of the need for further consultation to give an evidence base for the vision. The group agreed the work her group had done so far was good but agreed it did need more development. Nicola then talked about her group’s work on the renewable energy policy and everyone agreed that this was good. Mick pointed out to the group that a lot of this was already in the Cornwall Council policies he felt that if we agreed with the county policy we should simply say so and not repeat it. There was discussion about the survey results and where these should appear in the document. It was decided that as the survey results would change with further consultations being done we should wait until all results were in and then decide where these should appear, although general consensus was that they should appear throughout the whole document. Boundaries policy and Heritage was discussed and there was general agreement with a few alterations and additions. Derris presented the housing document. There was a discussion about the housing requirement/quotas. It was generally agreed that no matter what any parish desire maybe we would need to build our quota of housing against the requirement for Cornwall. There was a discussion about the length of some of the documents and it was agreed that at this point it was better to include everything that we knew or could think of and refine the documents later. Geoff presented the work of their group on Economic development/landscape and green assests. It was generally thought that they had made a good start and some improvements were agreed. There was further discussion about sustainable development and what this meant. Green spaces and the rural gap were discussed and importance of these being included in their document. Geoff explained that they had not yet started the landscape document but would complete it in time for the next meeting. John suggested that each group should swap their work to enable them to become familiar with and to adjust or add to each document. It was agreed but it was felt that each group needed more time to complete their own work before this exchange. John then suggested that our completed work should be emailed to Gemma for review this was agreed. Derris pointed out that it would be better to send the work to Sara Ardenas her review would be more appropriate. Derris suggested that we should hold exhibitions showing our work to date rather than another public meeting. She suggested that the village halls in Darite, St Cleer and Common Moor were good venues and that the exhibitions would give parishioners the chance to ask questions and to have their say. She asked for the group to consider some design ideas for the exhibitions. Thursday 6th February 2014 at 19:30 at the St Cleer Sports Pavilion Hockings House. Guest: Sarah Arden: (Cornwall Council Strategic Policy Team). Apologies: John Bailey and Suzanne Horsfeild. a) Overall view: 37 NDP areas in Cornwall have been registered. Some parishes have formed cluster groups hence 55 parishes (of the 213 parishes in Cornwall) have shown interest in producing NDPs. b) The plans are at various stages, the front runner being St Eval who are expected to publish their Draft NDP on Monday (10th February 2014). c) Nationally: Only 7 plans have been submitted for examination. One has been “failed” at the examination stage. Upper Eden is a rural community plan. Tame: is a Market Town (The cost of this plan: approx. £100,000). (The “Saved Policies” from the Caradon Local Plan are those currently in force: they will be replaced by the Cornwall Local Plan once adopted). An NDP can be approved before the Local Plan. C.C. Local Plan is expected to be adopted early 2015.
i) If Environmental Impact Assessment is required? ii) Have the community been involved and has attempts be made to contact for comments, all relevant groups organisations and age groups. The examiner can “Pass”, “Recommend Changes” or “Fail” the plan. For Planning Applications, the NDP will begin to be a material consideration after the consultation stage and will gain full weight after a successful referendum. We should be prepared to justify how the sites considered were selected and why other possible sites were not. In addition to housing we should include other important issues. Key strategy of maintaining the Rural Gap between villages, hamlets and communities is valid. Way ahead: Draft a Plan and re-consult. Sarah was thanked and left the meeting. i) Simon will circulate the up-dated Design Statement for approval. The next meeting will be on Thursday 27th February 2014 at 19:30, Sports Pavilion Hockings House. Thursday 16th January 2013 at the St Cleer Sports Pavilion Hockings House – 19:30. Mick Chorlton, Simon Soady, Nicola Ellis, John Bailey, Jenny Fowler, Geoff Simon, Jill Hager, Claire Keeley, Steve Keely, Suzanne Horsfield and Karen Partington Ward. Derris briefed the meeting with the progress so far and on the results of the Draft St Cleer Neighbourhood Plan Report and Consultation November 2013, including a questionnaire. (The results were included as an attachment to the Agenda of the meeting). The results, (285 completed questionnaires (20% response rate)) indicate that the steering group is generally heading in the right direction. The public meeting held at the Memorial Hall on Thursday 28th November 2013 was considered to have been counter productive. The draft St Cleer Parish Design Statement was discussed. There was generally support, however it was suggested that some of the statement should indicate “preferences” rather than “requirements”. The document should be checked against the Cornwall Council Local Plan and Design Statements to ensure that there are no conflicts. A NDP Policy for Renewable Energy should be progressed. A question was raised re “when will the NDP begin to be taken into consideration when considering planning applications”? Derris explained that the NDP will have greater weight as a material consideration in planning matters, as the stages of the plan are completed. The existing work is already being referred to in planning application documents (eg. Railway Crescent Darite development). To assist with the wording of proposed policies, it was agreed to invite the following to the next meeting: Richard Grant and Ivan Tomlin (noting the possibility of a conflict of interests). It was agreed that the Steering Group was open to any member of the parish. Peter Lockley should be welcomed to the group. In view of the urgency, it was agreed to press ahead with the NDP concentrating on housing and renewable energy policies. The Cornwall Local Plan will also be checked to see if any amplification of the policies are required to be added in the St Cleer NDP. Thursday 6th February 2014: at 19:30, Sports Pavilion Hockings House. A further meeting for Thursday 27th February 2014 is also scheduled. Thursday 14th November 2013 at the St Cleer Sports Pavilion Hockings House – 19:30. Mick Chorlton, Simon Soady, Nicola Ellis, John Bailey, Jenny Fowler, Geoff Simon, Jill Hager, Claire Keeley, Steve Keely and Julia Walsh. Apologies: Nuno Correira, Suzanne Horsfield. Derris briefed the meeting by explaining the Community Infrastructure Levy (CIL) and S106 systems that requires developers to contribute towards funds for the improvement of local facilities. The CIL from a development is paid to Cornwall Council; part is then passed on for use in the local area. (25% if a NDP is in place, otherwise 15%). However it is noted that St Cleer Parish is in a ZERO Rated zone for CIL, therefore NO CIL will be available from developments within the parish. The Draft St Cleer Neighbourhood Plan Report and Consultation November 2013, including a questionnaire, was discussed and approved for distribution (with agreed minor amendments / additions). The document is to be distributed by hand to the majority of dwellings in the parish and members of the steering group agreed to do this; the more remote areas would be covered by delivery by post with SAEs for the return of the questionnaire (approximately 200 houses, cost approximately £120 for printing and £200 for postage). Boxes for the questionnaire replies will be sited at the Market and Stag pubs, village halls at Darite and St Cleer, Open Doors, both primary schools and the Farm Shop. Deadline for return: Friday 13th December. The next public meeting will be at the Memorial Hall on Thursday 28th November. Doors open at 7pm, with tea coffee and biscuits. Display boards for the “PLAN” with maps and site appraisals will be available. Also requests for opinions of where developments should not be allowed e.g. Recreation Areas, (St Cleer Downs etc. ), AONBs. Also requests for opinions on which structures are of value and should be retained e.g. Listed Buildings, Chapel at Hockings House, the Liskeard and Caradon Railway Shed (opposite the Memorial Hall) etc. The meeting will start at 7:30pm and the Memorial Hall will be available for set up from 6.30pm. 4. A draft St Cleer Parish Design Statement was distributed and debated. It was suggested that the contents be considered at the next meeting of the Steering Party. (This allows time for prior analysis). Thursday 16th January 2014: at 19:30, Sports Pavilion Hockings House. Emery Planning Partnership is instructed by Wainhomes (South West) Holdings Ltd to make representations on the St Cleer Neighbourhood Plan (NP). Whilst we recognise the efforts of the Steering Group, we have significant concerns regarding the progression of the NP in advance of the adoption of the emerging Cornwall Local Plan (CLP) and the evidence base that supports it. We set out our position below. In light of the above the NP’s preparation is premature in advance of adoption of an NPPF compliant Local Plan. Indeed, we note that the Neighbourhood Plan accepts that “The Caradon Local Plan has now been replaced by the National Planning Policy Framework (NPPF) and the Draft Cornwall Local Plan”. Therefore there is no adopted up to date development plan for Cornwall or the former Caradon. A NP’s soundness depends upon a number of factors, including its general compliance with the strategic policies of the Local Plan2 and whether it is appropriate to adopt the NP having regard to the NPPF. As noted above the Caradon Local Plan is out of date, particularly in relation to the housing figures it contains. There is no post-NPPF local plan and the prospect of one being adopted is some way off. The NP therefore cannot be in general conformity with the strategic policies of a local plan that has not even been published or indeed examined. For this reason, the NP cannot be adopted ahead of a new local plan. We would therefore question if it serves any useful purpose to promote the NP in advance of the Local Plan and the subsequent financial and administrative resources required for all parties concerned. We also understand that the current consultation document is the result of the work of the Steering Group and has not been informed by any public consultation or input to date. The current consultation will obtain the views of residents but our concern relates to the fact that the views of the residents are being sought on a document that has not been prepared in accordance with national guidance or on an evidence base. On that basis the comments on specific sites or the wider issues will be made without being fully informed of the true position for example, the site that our client is promoting (site 7). Our concerns are set out below. Whilst we note that some 120 homes are proposed, this is based on the requirement of 2,000 homes for the Liskeard Looe Community Network Area in the emerging CLP. We note that at present in the emerging CLP that there is no St Cleer specific housing figure or, if there is, no indication that such a figure will be capped; and even if it was possible to establish a target for St Cleer, until a Local Plan is adopted one can have no confidence that the St Cleer figure would remain at 120 dwellings. All we have from the current consultation is that “St Cleer Parish’s fair share would be 120 further new homes by 2030”. Notwithstanding the above, we note and welcome the recognition in the plan that growth is necessary in the Parish. However the key question that the plan should answer but does not and cannot, is how much development, where and when. Whilst the plan seeks to provide some answers there are a number of significant failings which mean that the plan must be reconsidered and can only be done so once there is greater certainty with the emerging CLP and an evidence base is in place. At this stage the Parish cannot be certain as to how many houses it should plan for as Cornwall Council itself is unable at present to determine what the requirement should be in the emerging CLP as can be seen from the following. At the 15th October 2013 meeting of the Environment Heritage and Planning Portfolio Advisory Committee, members were unable to decide the housing requirement to proceed with and instead resolved to consider two options for the overall housing requirement within the pre-submission draft Local Plan of 42,250 dwellings or 47,500 dwellings. At the 15th November Environment Heritage and Planning Portfolio Advisory Committee, the same issues that were debated at the October meeting were considered. A decision could not be made and the Committee resolved that the matter is considered by the Cabinet at their meeting on 27th November 2013. As with the Environment Heritage and Planning Portfolio Advisory Committee, the Cabinet could not decide on the requirement and have pushed it up to the Full Council meeting on 14th January 2014 to decide. The SHMA will be a key part of the evidence base for the emerging Local Plan. What is does show is that the range of housing need is between 47,300 and 71,980 dwellings. Therefore even the higher of the two figures currently being considered by the Council is at the lowest end of that range. Even so if the Council agrees to a requirement of 47,500, that is 12.5% increase to the requirement that the St Cleer Neighbourhood Plan is based on. If a pro-rata increase is given to the 120 dwellings currently proposed, that would total 135 dwellings. From our discussion with the policy officers at the Council going forward, the key timescales going forward are as follows. · Late 2015 – Adoption, however if the Inspector raises issues on soundness at any stage then there will be further delay. Therefore it is clear that the Council is unable to agree what the housing requirement should be going forward and until that is finalised following the Examination the NP should not progress. Our client has a specific interest in Site 7 (Fields at St Cleer adjacent Penhale Meadow). The site is not one of the recommended sites in the NP. However the assessment has not been undertaken correctly or objectively it has been based on a development of some 210 houses. There are also a number of points which we wish to raise. The first is that we are proposing a development of some 60 dwellings, which is comparable to two of the “recommended” sites, these being Site 2 and 3. Our client has written to the Parish seeking a meeting to explain their proposals, however to date that has not occurred. However there has been no information requested by the authors of the NP as to our proposals hence why a development of 210 dwellings, has wrongly, been considered. A development of some 60 dwellings should be supported as it can generate greater levels of affordable housing and open space. It would also help maintain the viability and vitality of the settlement and offer enhancement to local services such as the bus service and improvements to infrastructure. The second is that the assessment states that the development would be accessed from the “short stub” off Penhale Meadow and Caradon View. It then states that these “narrow estate roads unsuited to either construction traffic or the increase in vehicles the development would bring”. Our client has instructed AWP Consulting to assess the access and their clear advice is that at least 60 dwellings can be adequately accommodated on the site both during and after construction. Again there is no evidential basis or consultation with Cornwall Council to justify the comments in the assessment. Indeed, the reason for the “short stub” was for later phases of the Penhale Meadow development and was designed as such. The development of the site would represent a logical and sustainable extension of the settlement and is capable of being developed to deliver an attractive and highly sought after residential location which could offer opportunities to enhance the sustainability of the settlement. The site is favourable in planning terms to a number of sites being promoted by parties elsewhere in the Parish. In light of the above it is considered that our client’s site is a sustainable development to meet the needs of the Parish and Cornwall. We would welcome future discussions with the NP steering group and Parish Council about the development of the site. We are not aware of any supporting documents, studies, Strategic Environmental Assessment or Habitat Regulation Assessment to support the NP process which seeks to accommodate around 120 dwellings and whether the recommended sites are the most sustainable option. Whilst we note the assessments in the current consultation the conclusions are based on opinion rather than evidence. As you will note from our significant concerns with the process to date the consultation document should have no weight for the purposes of decision making. The NP should await an adopted Local Plan and its content should be informed by an evidence base on the full range of planning issues. This concludes our comments at this stage. Notes of the – St Cleer Parish Neighbourhood Development Plan Steering Group Meeting: Wednesday 18th September 2013 at the St Cleer Sports Pavilion Hockings House – 19:30. Geoff Simon, Jim Hager, Karen Partington Ward, Claire Keeley, Julia Walsh and Suzanne Horsfield. Warleggan Parish have agreed (8 to 4) to compile an independent NDP but are willing to cooperate with other parishes on common issues. St Neot Parish have also agreed (almost unanimous) to compile an independent NDP and again have indicated that they are willing to work with other parishes on common issues. Richard Grant (St Neot) is the team leader for the Plymouth Development Plan. He has offered his services to the St Neot Group and is also willing to assist St Cleer with their plans. b) Caradon Local Plan Adopted – 1999. The group agreed that the character of St Cleer was typically that of a Moorland settlement. A main village with satellite hamlets clearly separated from each other by wide areas of green fields and felt that should those green areas be eroded there would be a considerable loss of character to the parish and that the green areas should be preserved. A list of planning applications for dwellings in the parish was also circulated. (Attached). This indicated that from 2010 to date, that for the parish, construction of 52 dwellings have been approved, there are 45 dwellings pending decision (Penhale development 30 and Hendra development 15) and 7 dwelling applications have been refused. 2000 new homes are required to be constructed in the Liskeard and Looe Community Network Area (including the Parish of St Cleer) by 2030. 1000 in Liskeard, the remainder in the rest if the CNA. It was estimated St Cleer’s share would be around 135 new homes. It was accepted that there is requirement for the construction of new dwellings in the parish. a) Field behind The Stag Inn (The site is within the Caradon Local Plan Area Proposal Map 18) 20 dwellings. Horizon Farm (East of Lane) Business / Job creation. d) Land adjoining Railway Terrace Darite (Approval given for 6 Affordable Dwellings PA11/01593). It was recommended that a questionnaire be drafted for circulation to all homes in the parish, requesting the community to indicate their acceptance / rejection of the above sites for future development. These can be distributed by hand delivery but will be required to be posted to remote locations. A request for funds to cover the costs of postage etc. will be made to the Parish Council. Where development is NOT allowed (protection of valued assets). Present: Derris Watson, John Bailey, Nuno Correia, Mick Chorlton, Geoffrey Simon, Simon Soady, Karen Partington Ward, Jenny Fowler, Jill Hager, Julia Walsh, Alan Silverstone and Nicola Ellis. The meeting opened with a round of self-introductions from members of the group. Questionnaires were distributed to ensure correct contact information and to ask members what were their particular skills and areas of expertise. They were also asked to record which part of the plan process they were particularly interested in. Infrastructure to service existing and new development i.e. Broadband and need for improvement and access. Results of the Housing Needs Survey and information from Homechoice and Homebuy. Much of the information is available through the Cornwall Council Website if one knows where to look. The meeting was advertised via an invitation leaflet drop to the dwellings of the parish and via banners located on the access roads. From 6:30 pm to 7:30 pm: Various maps of the Parish were on display including a map showing the 5 sites where land owners had registered with Cornwall Council, land in the parish for possible development. A poster board and flip chart, where the public could leave comments and questions was also available. Refreshments were served during this period. The 4 members of the Steering Group and Representatives of the proposed developments (Horizon Farm Site Bakers Hill and Hendra Site Darite) were available to discuss and answer questions from the public. The meeting opened at 7:30pm. Cornwall Cllr. Derris Watson opened the meeting by welcoming and thanking everyone for their attendance. Representatives of two of the proposed development sites in the parish were in attendance. (Two other possible developers had declined to attend). The Planning Application was Approved. The votes were 7 for and 7 against, the chairman of the committee then gave his casting vote in favour of the application. During the discussion at the committee meeting it was pointed out that St Cleer did not have any written evidence showing that a Neighbourhood Development Plan was being progressed. Also the Housing Officer reported that there were 30 applicants for the remaining 3 available dwellings at the Caradon View development site. These were considered as being significant factors affecting the decision of the committee. Disappointment was expressed that the Parish Council had not sent a member to speak at the committee meeting. Comments from the floor expressed that public objections to the application appeared to have been a waste of time. The importance of progressing a Neighbourhood Development Plan was emphasised. There was a call for a vote for the requirement to progress a NDP. A show of hands indicated that the majority were in favour of progressing the NDP (There were no votes against). Attendees were then invited to join the Steering Group. 12 parishioners offered to assist with the NDP (as detailed on the attached attendance list) and have joined the existing 4 parish council members on the Steering Group. The NDP would take approximately two years to produce and that the final stage would involve a Referendum of the Parish to accept or not the proposed plan. It was explained that the plan required a bottom up approach and that Community involvement was essential at ALL stages. It was further explained that in the interim period and before final adoption, that the further the plan is developed with documentary evidence, that the greater the weight would be given to it, when planning applications were being considered. Cllr Watson reported that an application for funding to cover part of the costs of the NDP would be made. It was suggested that George Truebody, who is coordinating the Rame Penisular NDP, be invited to give a presentation to the members of the community on the subject. A call for a vote re this suggestion was made. Again a show of hands indicated that the majority were in favour and that there were no votes against. Representatives of St Neot Parish Council indicated that St Neot would be willing to work together with St Cleer on common issues for the development of the NDPs and that there could be some mutual advantages by working together. It was also suggested that Warleggan could also be included. This matter would be decided after further consideration. It was reported that the community would be kept up to date with the progress of the NDP via regular public meetings (say every 2 months) and the derriswatson5 Facebook, where they could also post comments. Details would be published via the next leaflet distribution.